The remains of the Early Christian basilica of St. Isidore are partly covered today by a later, small church with a low cement roof. In the basilica are preserved mosaic floors decorated with geometric patterns, and many relief architectural parts. Inside the church there is a subterranean vaulted crypt where the relics of Saint Isidore and Saint Myrope (who martyred in Chios during the Early Christian period) were once kept. 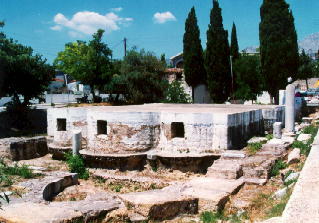 The Early Christian basilica of St. Isidore was built on the remains of an earlier, Roman structure. According to tradition, the church was built in the second half of the 7th century, during the reign of Constantine IV Pogonatos. In the course of its long history, it has undergone several repairs, probably during the Frankish occupation, in the late Byzantine period and in modern times. Five architectural phases - the earliest of which dates to the 5th century - have been distinguished in the building, which was finally ruined by the earthquake of 1881. The first excavation research on the site was begun by G. Soteriou in 1918 and continued by A. Orlandos, in 1928. Excavations were also conducted in the summer of 1981 and 1982, by the 3rd Ephorate of Byzantine Antiquities.